Before I start, I know some of you will not wholly agree with what I have to say, and that’s perfectly fine. Comment on this post and give counter-arguments if you wish, because what I’m writing here is about getting a conversation started, and inviting other perspectives in. Vancouver is one of the most beautiful cities I’ve ever been to. That is if you keep away from Downtown Eastside, which is like nothing I have ever seen before. This area has a very high population of marginalized people – the homeless, drug addicts, and the mentally or physically ill. When compared to the rest of Vancouver, the area shows a disproportionate pattern of poverty and crime. It is hard to imagine when you haven’t seen it yourself, I tried to give you a glimpse with the numbers below. As it seamlessly blends into the rather touristy area Gastown, it is easy to end up there by accident. That actually happened to me when I first visited Vancouver earlier this year. I avoid walking through the neighborhood now, and just take the bus to pass through there. But still, this is enough for me to pull out my phone to text my friends how bad it is for the hundredth time. Sometimes, my roommates have to work in the area, and it’s not unusual for them to see people taking drugs in the alleys, or seeing others walking around with a needle in their hand. I have also come across other statistics that reveal the city’s drug problem. Between January and October 2016, a total of 124 overdose deaths due to illicit drug use occurred in Vancouver1. To put that number in relation to past years, the total number of deaths in 2015 was 134, and 100 in 20142. Moreover, I came across reports3 4 about the substance fentanyl, which has been used to cut drugs more frequently over the last year, and has been responsible for many drug-related deaths. Taking all this into account made me curious about what the city of Vancouver is doing to address its growing drug problem. 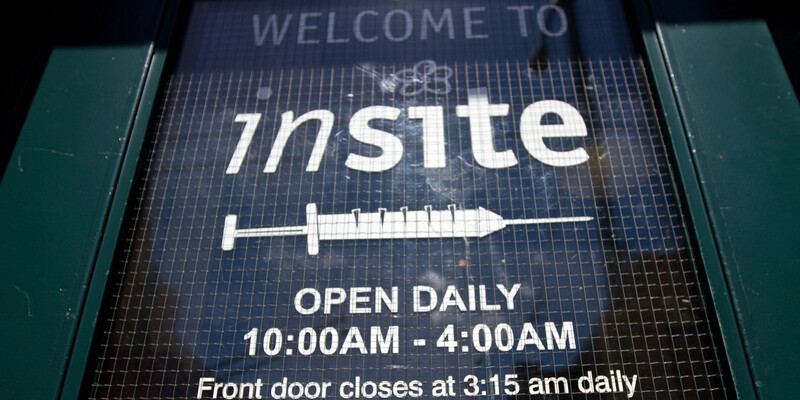 Back in 2003, Vancouver opened North America’s first supervised injection site, Insite, where addicts can “shoot up” under medical supervision, without fearing to be arrested. Besides, Insite provides sterile injection equipment like clean syringes and antiseptic wipes. The team consists of mental health workers, counselors, nurses, and doctors, who work to ensure the users’ safety, stabilize them, and refer them to detox programs. Revealing the positive impact of supervised injection sites, a study by the BC Centre for Excellence in HIV/AIDS showed that people who use safe injection sites are more likely to enter detox programs, and less likely to share needles, which aids the prevention of HIV/AIDS infections5. Moreover, from 2003 – 2011 overdoses near Insite dropped by 35%6, showing the localized success of the program. Vancouver recently applied for two new supervised injection sites to extend its services7. A different measurement taken by the city is the heroin maintenance program, which gives prescription diacetylmorphine hydrochloride (the active ingredient in heroin) to severe heroin addicts8. I agree that it is a thin moral line to provide addicts with heroin, but the program acts as a last resort, and has been successful in that the use of street heroin decreased and th number of overdoses and overdose-related deaths declined as well9. Other services that are also available at no cost are Withdrawal Management, the Methadone Maintenance Program, Sheway, which provides health and social service support to pregnant women and women with infants under 18 months who are dealing with drug and alcohol issues, and Community Substance Use services, including counselling and treatment recommendation10. Alongside this, free overdose training seminars, which teach people how to use naloxone in case of an overdose, are held all over the city. Naloxone kits are available for free as well. In order to receive a naloxone kit one has to self-identify as an opioid user. Since there still is a lot of secrecy and stigma surrounding drugs, many users are afraid of being negatively judged. This prevents many people from obtaining such a kit, and from seeking help in general. I want to emphasize why stigmatization and stereotypes are problematic. Drugs are not just common to the lower social classes, and not all users are what a large proportion of society paints them to be. Substance use, abuse, and addiction is present in every social class – from high-ranking businessmen, to chefs, to students, to homeless people. But it is much easier to single out the already vulnerable than the grade A student. I just want to point out that it is not uncommon for university students to use drugs, and that universities also need to start thinking deeply about how to address this issue11 12 13. I feel like there is a high level of personal responsibility placed on drug addicts, e.g. mindsets like “if they keep using, they won’t get better. It is their own fault that they are addicted to substance x.” Well, how about this: if no adequate help is provided, and/or if the barriers to getting help are too high, how are they supposed to get clean? It is the easy way out to blame addicts alone, and by doing this the responsibility to help is pushed aside – we don’t do this for alcohol or nicotine addiction, so why should other drugs be treated differently?! But for some reason, it is quite common to view and treat addicts like second-class citizens. Let’s not forget that they too are human beings, and deserve to be supported. I see harm reduction as a way of saying “we are not giving up on you, you deserve help.” In that sense, I think that Vancouver is off to a good start. Not only does the city take first measures to encourage safe drug use14, but it also addresses the users’ fear of legal consequences. In the case of an overdose, many users are afraid to call 911 because they fear police intervention. As a response, the Royal Canadian Mounted Police has adopted a new policy that members will not attend the scene unless they are requested to15. In addition, Bill C-224, which gives immunity for drug possession in case of overdose, is currently under review, and has passed the first reading16. In my opinion, the drugs (not just in Vancouver) needs to be addressed by a combination of different efforts – education, harm reduction, treatment, and decriminalization. As a preventive measure, it is necessary to start talking about drugs in school. In many schools, the topic is hushed up and teenagers are left to inform themselves. However, it is crucial to educate students about the different substances, including their risks. I mean, look at ecstasy pills, they are colorful, look fun, and seem harmless. People who do not know better might not be aware of how much potential damage popping one or two of these might do. Educating younger students about drugs can prevent that, and is crucial. If using drugs is not seen as a forbidden topic anymore, people become more inclined to seek help, and to open up about their struggles. In addition to drug education, harm reduction and treatment services need to be extended in order to support drug users to enter detox programs. Decriminalizing drugs would further add to these efforts. The most common arguments against a decriminalization, and for the existing prohibitions are deterrence and health concerns. As to the latter point, I want to point out that research has ranked tobacco and alcohol more harmful than most other drugs17 18. Also, other studies indicate that psychoactive drugs can potentially have beneficial health effects19 20. However, more research needed to fully understand their effects, which is difficult to realize because the substances are illegal. Another argument is that decriminalizing drugs would result in higher drug use. Yet, studies indicate that to be wrong as well21. Given that the so-called War on Drugs has not been effective in that it did not decrease the availability of drugs or their abuse, I think it is time to choose another path. It is important to remember that decriminalizing does not equal legalizing. By decriminalizing drugs I mean removing legal consequences for substance use and possession of a limited amount for personal use. If new regulations were limited to personal consumption, they would still comply with UN regulations22. The benefits of decriminalizing drugs include decreasing crime, reducing the costs of the criminal justice system, reducing the social isolation of users, increasing drug safety, and an increase in seeking treatment. In my opinion, legal consequences for drug possession and use are not the solution to the problem. Substance abuse, like alcohol abuse, is a medical, and not a legal issue. That means that legal measures that further isolate users, and punish them are not effective because the dominant perspective is flawed. The issue should not be countered with legal force, but with medical treatment, and scientific research. Likewise, a recent BMJ editorial called for placing health in the center of the debate23. This is exactly what Portugal started doing fifteen years ago. The country decriminalized the possession of all drugs, and alongside this increased its harm reduction and treatment efforts. If someone is caught repeatedly, they are advised to enter a detox program. If they refuse to do so, they are required to have regular check-ups with their family doctor. Here, medical experts are leading the way forward. Portugal’s approach is effective as it did not lead to increasing drug use, but to a smaller number of drug-related deaths, fewer problematic cases of drug addiction, and fewer HIV/AIDS infections24. Other countries that decriminalized drugs include the Czech Republic and the Netherlands. These examples revealed a similar success compared to Portugal25, and indicate that legal punishments for using and possessing illicit drugs do not reduce their availability or the number of users26. There is a growing problem of drug addiction and drug-related deaths, and previous efforts (as well-intentioned they might have been) have been ineffective in providing a solution. This calls for a new approach. After all, we would also change our method if we repeatedly failed to solve other issues. Access to the program is highly restricted and controlled. Participants must have participated in two earlier clinical trials on heroin maintenance, have injected heroin for more than five years, and have failed replacement therapy at least twice, one of in which methadone was used. I am aware this point might seem like a paradox to some of you. This is an important point because in today’s world we must consider national, as well as international laws. As to the UN regulations, drug use is not mentioned in reference to punishable offences in the Single Convention of 1961, the Convention of 1971, nor the Convention of 1988. In fact, the commentary to the Convention of 1988 states “it will be noted that, as with the 1961 and 1971 Conventions, paragraph 2 does not require drug consumption as such to be established as a punishable offence.” [Source] Drug possession is more explicitly addressed, but it is distinguished between possession for personal use, and for illicit traficking. As the commentary to Article 3 of the Convention of 1988 shows personal use and possession does not require criminalisation, and each member state can define its own laws.